A view inside MMP16-04. Smoky quartz and red tourmaline crystals are visible. Digging Pocket 11 turned out to be a protracted and tiring affair. With it's completion, however, we were ready to start mining up strike. 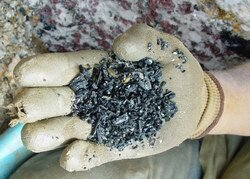 Our original goal, and still very much on our agenda, was to get a thorough cross sectional view of the Mt Mica pegmatite by taking a fresh cut as far up strike as we could manage. We planned to push this cut eastward and into the 'Irish' or 'New Mt. Mica' pit. This pit had been developed 1940s for feldspar and is located just to the east by only yards of the Mt. Mica cut. . 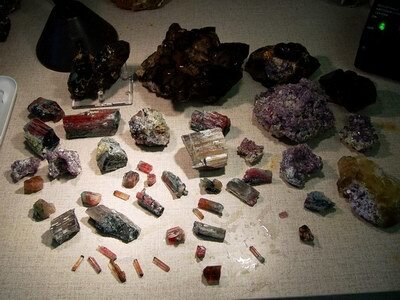 Although a few pockets were encountered, including one that produced beryls of odd crystal form, no cleavelandite or lithium mineralization, and therefore elbaite, had been found. Hurlbut and Wenden, in a 1951 article titled 'Beryl at Mount Mica' published in the American Mineralogist , suggested that perhaps the Irish pit was too shallow and had passed over the descending pocket zone from the 'Mt Mica' pegmatite. From surface examination, the Irish pit would appear to be in the same body as Mt. Mica. Our plan is to stay on the garnet line as we work up strike and follow it as far as we can. Hopefully it will continue into the Irish pit and thus expand the tourmaline producing zone beyond the classical Mt. Mica portion. Frank Perham, when he started mining at Mt. Mica in the 60s, did not encounter elbaite at the far eastern extent of Mt. Mica workings. Perhaps he too was above the garnet line and therefore the pocket zone. This cut unfortunately requires us to remove as much as 30 feet of overburden to reach the pegmatite. Our efforts had started at the western end of the pegmatite where the country rock was the thickest. As we work eastward this layer will gradually thin to less than 8' in the Mt. Mica portion. In the Irish pit the pegmatite appears at the surface. No overburden removal is required. This has led some to speculate that the pegmatite of the Irish pit is actually a separate body overlaying the Mt. Mica pegmatite. We had become spoiled thus far in working Mt. Mica. It seems that we encountered a significant pocket after every blast. During August though we would have to mine through a sizable dry zone. As we worked up strike and slight down dip of the Dagenais, we soon encountered what appeared to be a xenolith of country rock. Most probably this body played a roll in both the formation of the 40 foot + Dagenais pocket and the dry zone we were working. This xenolith persisted for more that 20' up strike and more than 10' down dip. Just as we reached the up dip side, the pegmatite, from our down dip perspective at least, underwent a major dislocation upwards. In the image at the left the xenolith is the dark rock near the lower center of the picture. Just above Richard the pegmatite can be seen rising another 10' higher. The orange circle marks a small vug filled with an unknown fibrous material we hoped to recover after the next blast. On the 6th of August we opened two small pockets ( MMP14-04 and 15-4) in the down dip face. 14 was exposed by the blast and was apparently water filled. 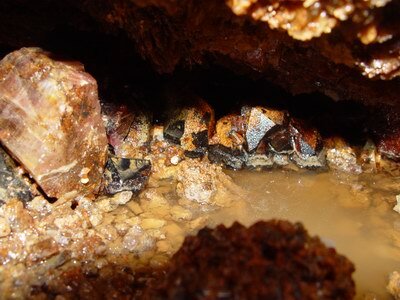 The draining water had deposited a beach of cookeite on the pit floor in front of the pocket. This pocket produced only quartz crystals despite the promise of abundant gold cookeite. Pocket 15 was opened by digging into the wall in an area that displayed pendant schorls and a thickened garnet line. This was the first pocket we exposed by simply chipping on the face. The pocket yielded hundreds of small very dark tourmalines with the occasional green or dark blue termination. 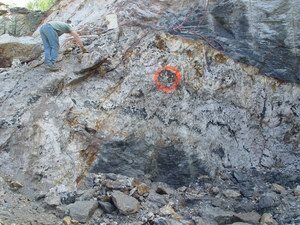 As we mined up strike and into the the displacement mention above, the pegmatite thickened to more than 25 feet. The section we had been working since Spring had been no more than 10 to12 feet thick. Interestingly, in the transition zone between the 2 sections there developed two separate garnets lines for a short distance up strike. There was pocket formation and lepidolite associated with each. All of the pockets encountered had experienced significant alteration of their contents though. Another remarkable feature was that just up dip of the displacement there occurred a zone rich in lithium minerals and pollucite. As we worked the displacement in the down dip direction this enriched zone persisted and intensified. 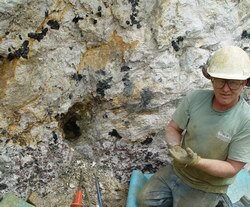 On August 12 while drilling a bench just in front of the thickened portion of the pegmatite, our farthest down dip hole drilled into some rusty wet material. This is always a good sign. After the blast, it was readily apparent that we had just grazed a pocket. Our first examination showed the pocket to contain a large quantity of loose granular lepidolite. 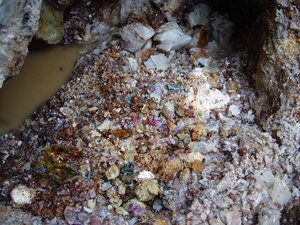 Digging a little further into the pocket started to yield large numbers of match stick sized pink gemmy tourmalines with either dark blue or green caps. This was exciting for us as heretofore we had only encountered green tourmaline. Chiseling the pocket front to widen it, we soon saw smoky quartz crystal groups lying in the pocket with several large reddish tourmaline segments. ( see image at the top of the page) Banking the loose material up in front of the pocket produced a beautiful beach of lepidolite and pink tourmaline. Note the pendant lepidolite rimmed mica book at the rear of the pocket.